Katelyn Levesque of Central Aroostook High School in Mars Hill plays the ball during a recent game in Mars Hill. The junior has scored 107 career goals, including 38 this season, to help lead the Panthers into Saturday's state title game in Bath against North Yarmouth Academy. Katelyn Levesque didn’t get the size in her family. She is 5-foot-3 while her older sisters, Karli and Kassie, are 3 or 4 inches taller. But Central Aroostook’s junior striker was definitely blessed with the soccer scoring touch. Katelyn Levesque has amassed 107 career goals, the last four coming to rally the Panthers of Mars Hill from a two-goal deficit to a 4-3 victory over four-time defending regional champion Ashland in Wednesday’s Class D North title game. “It was a pretty good day,” Katelyn Levesque, who pushed her season total to 38 goals, said. She ranks 12th all time among Maine schoolgirl scorers with her 107 goals and she is her school’s career scorer leader, boys or girls. Central Aroostook (16-0-1) faces 13-3-1 North Yarmouth Academy in Saturday’s 3 p.m. state championship game in Bath. Like her sisters, Katelyn is playing for her father, Panthers head coach Joe Levesque. She said he is tougher on her than her teammates, but she feels it is important he doesn’t show any favoritism. “He pushes me a lot but it gives me added incentive. It has helped me become the player that I am,” Katelyn said. “You have to be very careful,” Joe Levesque admitted. He considers Katelyn the most talented soccer player among his three daughters. “She is more skilled with the ball on her foot. She is the better finisher,” he said. Katelyn said she benefited from having her older sisters go through the CAHS program ahead of her. She played two years with Kassie but she was in eighth grade when Karli was a senior. “I always watched them and saw how they responded to things. I learned from their mistakes,” Katelyn, who got a huge hug from Karli right after the Ashland game and considers Kassie to be her best friend, said. Joe Levesque said Karli and Kassi were versatile players but that Katelyn is a true striker. “She’s a finisher,” he said. Katelyn Levesque said she benefited from playing two years with the Black Bear United club program in Bangor, which is 145 miles from Mars Hill. Katelyn also took a memorable trip to England with her Black Bear United teammates. Levesque didn’t think about her goal total until she found out about it on social media when she broke the 100-goal benchmark. “To do it as a junior gives me a feeling of self-accomplishment,” Katelyn said. She said the biggest area of improvement for her this season has been the mental aspect of her game. “I’ve been able to stay calm. When we fell behind Ashland 3-1, I didn’t give up. I knew we could still do it and we found a way,” Levesque said. She said she couldn’t have accomplished her considerable individual success without her teammates. 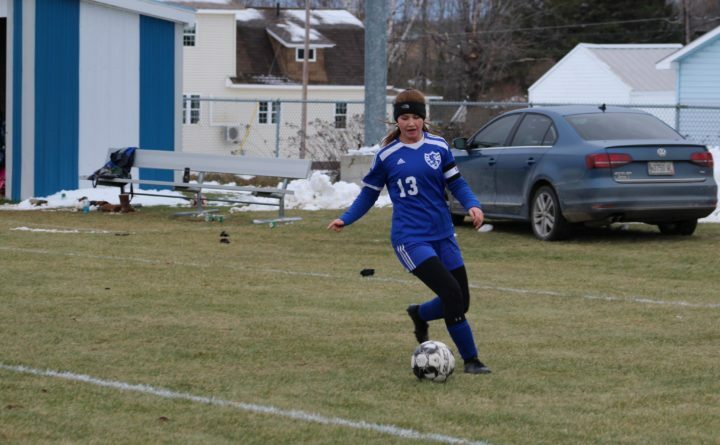 “We do it all together as a team,” Katelyn Levesque, who hopes to lead Central Aroostook to its first soccer state championship, said. “I’m so excited. We’ve never done it. Hopefully, we’ll pull through,” she said.